Once again, we have surpassed our previous year’s total of quilts delivered throughout the United Kingdom. This year we have delivered just over 36,000 quilts compared to 30,000 last year. This is all down to the commitment of our co-ordinators and their volunteer quilters who want to give as many children as they can a hug they can keep. Hi – My name is Denise and I am a very very proud mummy to Theo. He is an amazing little boy and has fought all his short life to stay alive. 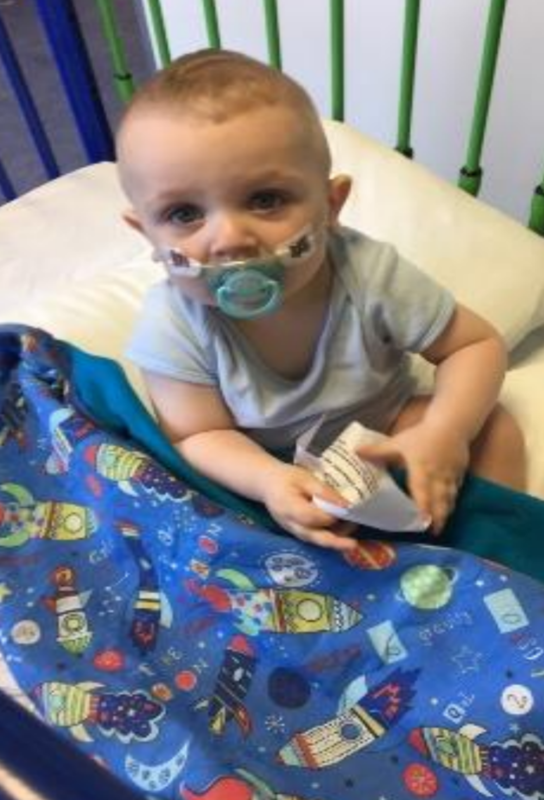 He has recently had his 37th operation and we met a little girl with one of your Linus quilts at Bluebell Woods Hospice – I thought it was amazing and thought that I would love Theo to be the proud owner of a quilt! Theo was born 4 month early and had 5 strokes in the first week of life. He has lost his stomach, is fed into his bowel which is now failing. Two years ago, meningitis took his sight but he still keeps fighting to be here. We are under Bluebell wood children’s hospice as Theo is palliative. He’s back in the hospital tomorrow – but want to send you this picture of him with his blanket. He’s taking the blankie with him. You must be a very special people and we really appreciate everything you do. Bless you all. I started as Coordinator in December 2010 and the Dorchester & District Angling Society (DDAS) have supported Project Linus in West Dorset every year. (The link is my father who was a very keen angler). When collecting membership fees every year they ask members to include an extra sum as a charitable donation and we have had the benefit of this. They have also had a duck race with the proceeds being divided between Project Linus and Julia’s House, the local hospice for children. This year they also had a fishing competition – guess the total weight of carp caught in a 24-hour period. A very cold 24-hour period with fish not biting I am told! Biting or not, it resulted in a massive cheque for £625 being presented to us. I have totalled up all the donations from DDAS over the last years – £2604. They have been superb – so thank you lads! Hi there, My little boy has just received a lovely blanket from yourselves. I just wanted to message and say what a lovely thoughtful idea this is. Just as we were beginning to feel a little down in the dumps after being in ward 19 at Wishaw for 2 days the beautiful blanket we received has perked us up. This is my son Jax enjoying his blanket. Keep up the great work! Hello to all you wonderfully skilled and generous women. I’m writing to tell you a little about the impact your quilts make in our service. I work for Women’s Aid East and Midlothian; I currently manage the children’s services. I’ve been around for 9 years. Our organisation supports Women, children and young people who have experienced domestic abuse. At times this can mean that a family comes to live in our accommodation with little more than what they carry in plastic bags. They have left all their possessions, friends, pets, toys and familiar things. Very often children are the last to know what is happening and are bundled up without any explanation or time to gather their most important things. They move into a new house, with lots of new rules about keeping safe. “Don’t tell anyone your address” “You can’t have your cousins over for a sleep over” At a sad and confusing time, we work hard to make things as best they can be. This is where your quilts come in. We believe that every child and woman should have something that belongs just to them (unfortunately our funders won’t pay for these things). I recently held a Linus Workshop Day with Perth Quilting Group “Piece Partners”. A total of 14 quilts were made on the day and great fun was had by all. I would like to tell you about the Sew Saturday that was hosted on 15th September by our wonderful Kate Barnes, the owner of Calico Kate fabric shop in Lampeter, here in West Wales. Kate has always been a huge supporter of Project Linus, donating large quantities of fabric and completed quilts that have been on display in her shop. Her shop is an Aladdin’s cave of fabric spread over 8 rooms and two floors which brings quilters from many miles around. She decided to host a Sew Saturday to support Project Linus, Pyjama Fairies and the Air Ambulance and invited us to the shop to demonstrate our work and talk to those who were interested. I made up 20 packs for tiny quilts to go to our local Special Baby Unit in Glan Gwili hospital and was able to hand out 14 of them – so far so good. I also handed out information sheets about Linus. Since that day my phone has been red hot with ladies wanting to tell me they had finished their quilts and could they have more packs, and I have given out another 10 packs with many more on order! Most delightfully of all, one lady runs a children’s club allied to her local church and they raised £180 via their Harvest festival which they are going to use to buy fabric and the children are going to have a go at making the quilts. 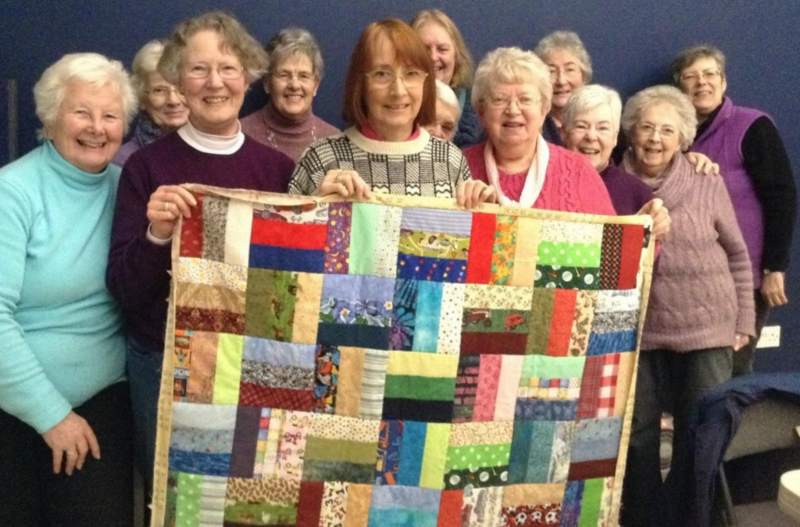 Poldrate Quilters, who meet in Haddington, East Lothian, have been staunch supporters of Project Linus for many years. 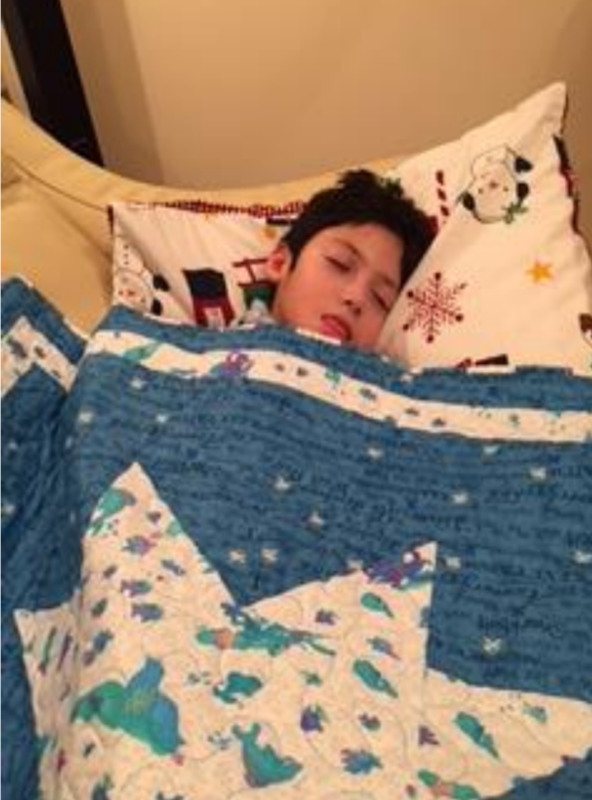 They set themselves a challenge to make 100 quilts for Linus during 2016 and achieved this in December. Many congratulations and thanks to the group for this remarkable effort.